Sometimes Windows Updates can cause computer problems, and the only temporary solution for some users is to remove the update from their computer so they can restore they computer back to the original functionality. Please know I suggest against doing so, since updates are not sent out just because Microsoft can, they normally have a good reason to do so. Anyway in this tutorial I will show you how to remove an update in Windows 10. 1. Begin by opening the Control Panel, by right-clicking the Windows logo, then choose Control Panel. On a touch enabled device, you can touch and hold the Windows icon, then choose Control Panel. 2. Then within the Control Panel click on Programs. 4. This can take a while, depending on how many Windows Updates you have installed on your system, wait for the list to load and then find your update. Click on the update and then choose Uninstall. 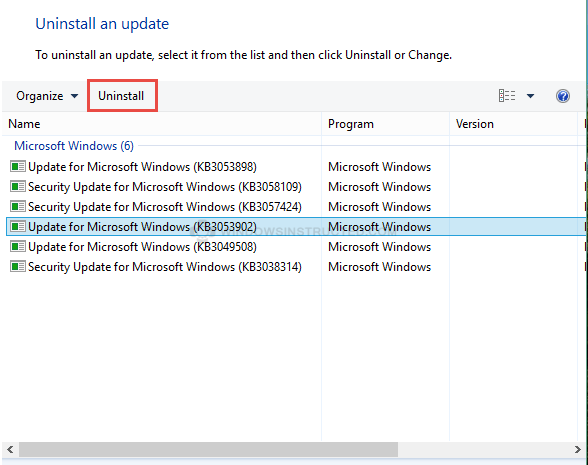 If the uninstall button does not appear then you cannot uninstall the selected update from your system, this can have multiple reasons for example this update was a service pack, or the update was replaced by a new update on your system. There is nothing that can be done to remove these updates.